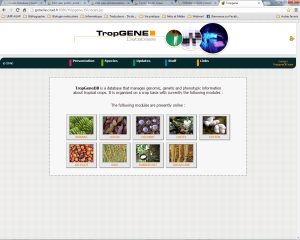 TropGeneDB is a component of the South Green Bioinformatics Platform for the management of genetic, molecular and phenotypic data on tropical crop species. The most common data stored in TropGeneDB are molecular markers, QTLs (Quantitative Trait Loci), genetic and physical maps, genetic diversity, phenotypic diversity studies, and information on genetic resources (geographic origin, parentage, collection). TropGeneDB is organized on a crop basis with currently nine public modules (banana, cocoa, coconut, coffee, cotton, oil palm, rice, rubber tree, sugarcane). Crop-specific Web consultation interfaces have been designed to allow quick consultations as well as personalized complex queries. Hamelin C, Ruiz M, Argout X. TropGENE-DB, a multi-tropical crop information system. In: 4th International Workshop DILS. Philadelphia, USA; 2007.